Fellowes Powershred 125Ci cross cut shredder is simple and practical office unit with automatic start/stop and jam proof technology. It is designed to be used for workplaces with up to 5 people. This paper shredder can shred other media like paper clips, staple pins, credit cards, and optical media. Creating cross cut particles of 5/32" x 1 1/2", the 125Ci shredder delivers a security level 3 (P-4). 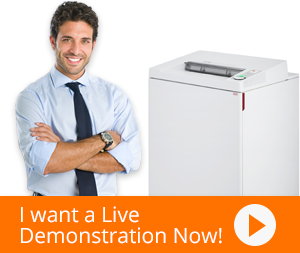 Fellowes 125Ci is a 100% jam proof shredder; automatically reverses in case of paper jams. It features an advanced safety feature to prevent human injuries; stopping the shredder whenever it detects fingers close to the feed opening. It places in sleep mode after two minutes of inactivity; saving energy costs. Fellowes 125Ci cross cut shredder utilizes Silent Shred technology to shred without disturbing the work environment. This shredder continuously shreds for 45 minutes with a 45-minute cool down period. Fellowes Powershred 125Ci cross cut shredder comes with castor wheels that allow it to be moved easily from one room to another. This also helps in emptying the waste bin effortlessly as the shredder can be moved without any trouble. Experience sleek design, innovative technologies and hassle free shredding with the powershred 125 series of cross cut and strip cut shredder. These 18 feet models can shred continuously for up to 45 minutes and power through CDs, DVDs, credit cards, paperclips, staples and junk mail. The 125 series also includes a convenient 14 gallon pull out waste bin. With Fellows patented 100% jam proof system paper jams are no longer a frustration. Our advanced jam proof system will not only prevent the shredder from being overfed but also manages miss fed paper by pausing the motor, reversing out the paper and then powering through the tough job. Simply watch the light bar to maximize productivity, green to yellow gives you the feedback that you are shredding within the recommended capacity while red means you are over the sheet limit. Safety also counts, our advanced safe Sense technology automatically stops shredding when hands touch the paper opening. With the 125 series shredding won't be a noisy disruption. It's silent shred performance ensures the shredder is ultra quiet when in use. These shredders also feature our exclusive energy saving system optimizing energy savings both in and out of use. Experience innovation power and durability with Fellowes the world's toughest shredders. Q. Are paper jams common with this shredder? A. No. The 125Ci has a special Jam Proof technology that provides zero paper jams. Q. What is the risk of injury? A. The Powershred 125Ci has special technology that senses a human hand near it and shuts off immediately. Q. How often does the bin require emptying? A. It has a special indicator that lets you know when the bin is reaching maximum capacity. Q. Why is it more expensive that a strip-cut shredder? A. The Powershred 125Ci is a cross-cut shredder and offers more secure shredding than a strip-cut shredder. Q. How much run time does it have? A. The Powershred 125Ci is capable of non-stop shredding.